There is a wind turbine sitting atop a 120-fooot-high tower at Barracks Beach, on Presque Isle (which is actually a peninsula), in Erie, Pennsylvania. Per the Presque Isle Partnership website, "The Partnership sponsored the Presque Isle Wind Energy Project, which included the installation of the 10 Kilowatt wind turbine on Barracks Beach across from the Stull Interpretive Center. It produces between 11,000-12,000 kwh/yr of clean, emissions-free electricity; enough power to sustainably run the center." The blades were removed for maintenance in October of 2011, and have not been restored as of April 2012 when this was written. A story titled, "Wind Turbines at Presque Isle Await Decisions on Future," reported on the reason for removing the blades. 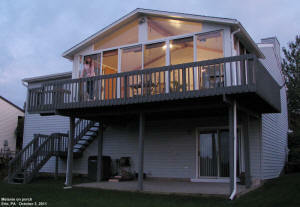 Our house sits on a ridge along W. 42nd Street in Erie, PA, and it has an open view of Lake Erie, to the north. From our upper back porch we can watch the ships cross on their way between Lake Ontario to the east and Lake Michigan to the west. On a clear day, we can see the trees on the Canadian shoreline, and can even see the top of the water tower at Port Rowan, in Canada (42 miles away). Bushnell 8x40 binoculars pull everything in quite well, but the Celestron 15x70 binoculars really bring them near to a person. There is also a clear shot of the Barracks Beach wind turbine. From our vantage point, just the turbine and about the top 10-20 feet of the tower are in view. I used a Celestron NexImage camera with my Celestron 8SE telescope to make this short video of the wind turbine in action. The image quality is pretty bad since I recorded it in a very low resolution mode in order to avoid jerky motion. The camera is normally used with the telescope to record images of the moon and planets. Melanie standing on our back porch. View of Canadian shoreline from our back porch. To the left is a view of our back porch. It's a nice 12'x18' aluminum and glass model that faces NNW. Polaris (the North Star) is about 15 degrees to the right of the centerline. In the spring of 2012, I plan to add a 6'x6' extension to the northeast corner (left in the photo) along with a concrete pier rising up from the ground to hold my Celestron 8" telescope. The southern view from there is blocked up to about 20° from the horizon, but the northern view is virtually unobstructed. This photo of the Canadian shoreline was taken May 11, 2011. The altitude of our back porch is 897 feet ASL according to a Garmin GPPS unit. Lake Erie altitude is 571 feet ASL (above sea level). 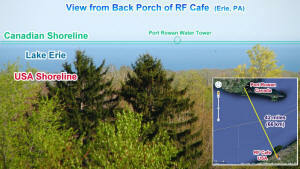 Port Rowan altitude is 602 feet ASL. Our porch is about 4 ft higher than the road, so it is at about 330 feeft above Lake Erie. The Port Rowan water tower is 170 feet tall, so the navhaz light is about 201 feet above Lake Erie. A Line of Sight calculator estimates a total LOS for these altitudes of 46 miles, which is consistent with my observations. The Canadian shoreline is in sight from east to west.